I've been making homemade granola for a few months now. However, since my neighbourhood supermarket stopped carrying old-fashioned oatmeal, my routine got disrupted. I don't really understand why they only have the quick-cooking and minute oats because these two varieties are generally not great for baking. Well, I don't really enjoy the inconveniece of travelling further to my local bulk store to buy oats but turns out there is a silver lining. I noticed today that the bulk store carries rye flakes and spelt flakes. They look almost identical to oatmeal except for different shades of brown. I experimented with a blend of oats, rye, and spelt for my granola recipe and I am quite happy with the result. There is no discernable taste difference because the maple flavour is quite overpowering. However, knowing that I get to consume a variety of whole grains in my morning cereal without any extra work? Well, that surely makes me feel a little virtuous. The road to eliminate refined grain products such as white flour and white rice from my diet is not an easy one. I do miss eating fluffy white bread (pain de mie....mmmm) but having delicious granola everyday for breakfast really makes things a little easier. What would you do if you have a full day of free time and sunny weather beckoning outside? To me it sounds like a perfect day to go around the city in search of good food. Before I return to my very strict weight loss diet, I want to have one last hurrah of an interesting food adventure. 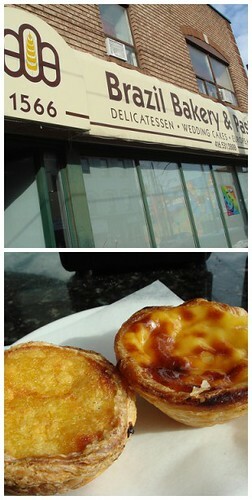 With a little planning, I decided to seek out my favourite version of pastéis de nata in Toronto. You're not mistaken. My first stop did not involve any portuguese custard tarts. 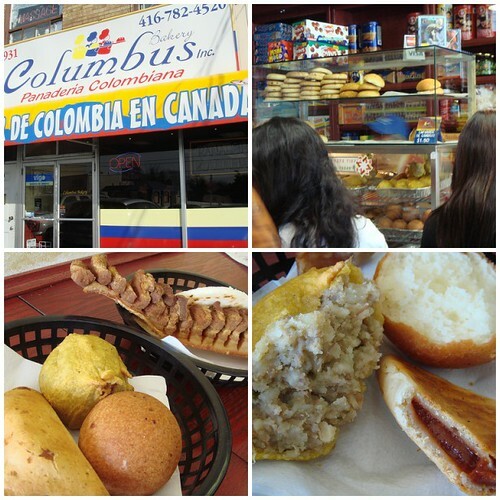 Since my route today broungt me over to Dufferin Road, I decided to stop over at one of the few Columbian bakeries in Toronto, Panaderia Colombiana. I first learned about this bakery from an article in Toronto Star and it was a delicious detour. The bakery was buzzling with customers looking for a taste of home. As soon as I walked into the bakery, I took a quick scan of what everyone was eating and proceeded with the tried-and-true pointing technique of ordering. It was quite exciting to discover what we ordered...we had a papas rellenas (potato and meat croquette! ), empanada de cambray (pastry filled with guava jam), deep-fried pork served with arepas, and a plain bunuelo. Bro and I are both fans of croquette so fist-size ball of mashed potato with meat was a hit. The bunuelo reminded us of a traditional Cantonese fritter for congee. The deep-fried pork was a little fatty but I enjoyed picking out the lean parts to munch with the arepa. The best of the bunch though was the empanada filled with guava jam. Since coming back from a feast of Cuban pastries in Miami, I discovered my love for guava jam. To my surprise, Bro loves the floral taste of guava too. Our first stop for pastéis de nata was Brazil Bakery & Pastry Ltd. My first impression was how resilient the pastry was. I had a hard time tearing it apart. The custard was more gloopy than expected and tasted a little artificial to me. Brazil has many variations of tarts, one of which was an orange curd filling. It was pleasantly citrusy and a good departure from the usual custard filling. Other fillings available include almond, coconut, cherries, etc. Brazil Bakery & Pastry Ltd. Walking eastward along Dundas Street West brought us to the heart of the Portuguese community in Toronto. Nova Era has a few locations around the city and this particular one has a nice large seating area for customers to enjoy the pastries. The pastry of their pastéis de nata was crispy and shattered with every bite. The custard tasted of fresh eggs and vanilla. It was my over-all favourite today. Bro enjoyed a meat patty with a "crust" made with mashed potato and (what else) deep-fried. I was interested in the cod fritter however...perhaps another day. Across the street from Nova Era is Caldense Bakery, another Portuguese bakery with a few locations in Toronto. The custard of these tarts was alright with a nice smooth texture but the bottom of the pastry was underbaked. The taste of raw dough was faintly detectable and that is a big no-no in my books for pastries. Bro ordered a tart filled with a transparent golden filling. I thought it was pineapple but it was squash. Who would have guessed? It looked very intriguing with subtle flavour. My last stop of the day was Venezia Bakery. This bakery has a homey vibe with two motherly ladies patiently explaining to me the different pastries available in the display case. I really want to like this place but unfortunately the pastéis de nata here was also slightly underbaked. 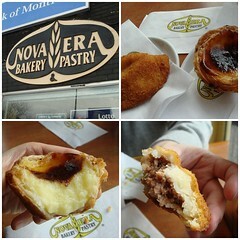 If you have suggestions for awesome pastéis de nata around the greater Toronto area, I would love to learn about them! Despite not being a huge fan of consuming crustaceans (mild allergic reactions quickly come to mind), I simply could not refuse an opportunity to try a regional specialty from an institution. That was how I ended up at Joe's Stone Crab in Miami Beach last Monday. I've heard stories of their no reservation policy and the infamous wait for a table. However, as luck would have it, the restaurant was closed on the day I visited. ML and I quickly made a beeline to the adjacent takeaway counter. Honestly, I was only too glad to escape the ubiquitous 18% gratuity charges added to all the bills at Miami restaurants. 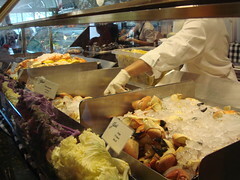 The takeaway was a happening place with the stone crab claws displayed proudly behind a glass barrier. I could watch the cooks smash open claw after claw as the orders came in. The claws were market price of course and they were actually priced by the size: medium (8 per order), select (7 per order), large, and jumbo. Interestingly enough, the price gap between medium and select grade was a hefty $10. After much discussion, ML and I decided to splurge for the select grade along with an order of fried calamari. There were a few tables in the takeaway section but it was even more wonderful that Joe's opened up the patio over at the restaurant so customers can enjoy their meals al fresco. 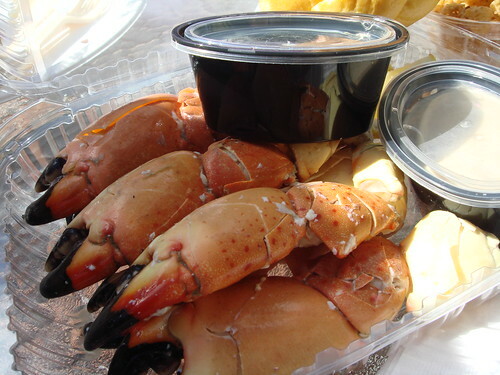 A picnic of stone crab quickly ensued. Lucky for us, the crabs are in season right now so every claw was meaty and fatty! A little dab of the housemade mustard mayo really enhanced the sweet taste of the meat though the drawn butter was a more traditional accompaniment. I really liked the two different types of dinner rolls that came with the meal as well. The bread was soft and eggy. ML and I both agreed that the stone crab claws were worth every penny. The fried calamari were okay. The batter was laced with a mild curry flavour and the calamari were tender. However, I thought the batter was just a little too thick. Well, it was a bit of a let-down in comparison to the deliciousness of the stone crabs. If the stone crab is all you're after, I personally don't think it's worthwhile to eat at the restaurant. The service at the takeaway was brisk and efficient. The food was packed nicely for an impromtu picnic. Why endure the wait? I had little time to do any researches on local favourite restaurants before leaving for a skating vacation in Miami last week. A few musts were on my list including Joe's Stone Crab and Sardinia Enoteca, both of which offer something I can't easily get in Toronto. In Toronto, despite the proliferation of Italian restaurants, most of them are along the lines of mediocrity. I was understandably excited about the prospect of excellent regional Italian cuisine. I arrived at the restaurant during last afternoon, nearing the end of their lunch hours. I was looking forward to try a few dishes from their dinner menu so I was a little disappointed that they were not available at the time. The complimentary bread basket included their famous imported Carasatu flatbread from Sardinia. 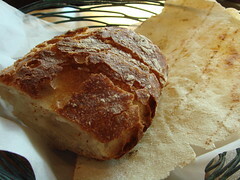 It had a pleasantly subtle flavour though I was more impressed with the loaf with its crispy crust and soft most crumb. The bread went well with the light fruity olive oil. I looked through the menu many times and was seriously tempted to order one of their pastas. However, since there was only one of me, I really couldn't order that much food. I settled on a vegetali platter and fegatini di pollo. I've read that Sardinia Enoteca is famous for their wood-oven cuisine and wow, was I in for a treat with the vegetali platter! My platter consisted of asparagus & pecorino, cipoline al forno, brussel sprouts with guanciale, roasted beets with pancetta, and braised fennel. I feasted on the vibrant colour, the varying texture, temperature, and of course the natural sweetness of all the vegetables. 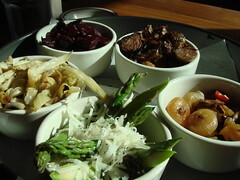 My favourites were the roasted beets and cipoline onions. The beets were steaming hot, with the concentrated sweetness of the beets contrasted by the smokiness of pancetta. The cipolines were slightly chilled and bursting with a vinegary sweetness which was so appetizing. All the vegetable were perfectly cooked and brought out their natural best.This platter was the perfect argument for vegetarianism. 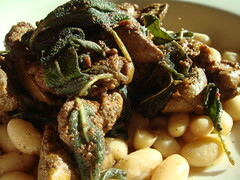 The fegatini di pollo is a dish of pan-seared chicken livers with butter and sage served with bean salad. I must say I was not impressed as the livers were cooked to the point of chewiness. The whole dish was just quite bland. Upon seeing my barely touched dish, my waitress asked me if everything was okay and I expressed my thoughts. She took the plate away and comped the dish from the bill. I think this gesture reflects very well on the service of this restaurant. For dessert, I decided to go for the strawberry tiramisu. 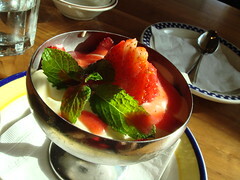 It was light and creamy, a refreshing end to the meal. Nothing particularly elaborate but most Italian dessert tend toward simplicity anyway. I would definitely return to Sardinia Enoteca next time I'm in Miami. The price is comparable to most touristy restaurants on Lincoln Road yet the quality is entirely on a different level. It's too bad that I did not get to try their dinner menu but my preview from their lunch menu is enough to ensure a second visit...hopefully with friends so I can try more dishes! I did a few things in the last couple of weeks which ensure a "bubble of silence" around me. The verdict is still out if this is really a good thing. However, when I discussed this with a friend of mine, she made an interesting point. She suggested that perhaps being open to the idea of re-establishing communication would help to unknot some of the issues that have been bothering me. It doesn't mean I really need to talk to him, just learn to be comfortable to the idea. I can't say I disagree but at the same time, I don't think it is as simple as that. I can go on and on about my side of the argument but I suppose it all comes down to forgiveness. Forgiving others is really a way to release myself from many negative emotions. However, I have yet to learn to be kind to myself. Everything that I ever cherish has been results of hardwork. It is my understanding that everything in life, be it work, family, friends, romance, hobbies, I must constantly contribute in order for it to prosper. It does not make sense but my mind sees being kind to myself as an act of weakness, a sign of slacking off. I believe that I need to push myself constantly so I can achieve more in every facet of my life. There are very few people that I got angry with because only people who are (or were as the case may be) close to me can truly hurt me. I am very fortunate that I am surrounded by people who care a great deal about me. However, I don't know how to forgive those few exceptions because somethings just don't add up. Think about this: a person hurts me, shows no sincere regret, and I go back for more?! I am not a doormat nor a push-over by any means. I really can't justify the act of forgiveness and still be able to look myself in the mirror wtih any self-respect. I am very confused and the cause of this confusion is not something that I can ignore. Distraction and sweeping things under the rug can only work for so long. Silence is not golden but I don't know what else I can do. 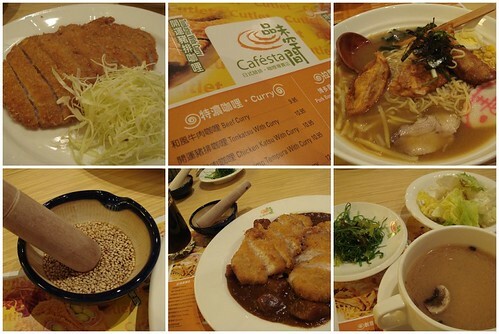 The menu was divided into tonkatsu, curry, omelette fried rice (omuraisu), ramen & udon, snacks, and drinks. That was quite a large menu for a specialized restaurant but since it features some of my favourite yoshoku items, my excitement did not diminish. After much dicussion, bro and I decided to order a thick-cut tonkatsu set, a curry tonkatsu set (regular thickness), and a gyoza ramen in miso broth. I was really hoping to try their omuraisu but I figured it would be nicer to stick with their specialties. Each set meal came with miso soup, salad, marinated seaweed, rice, and green tea ice-cream. I was expecting the thick-cut and regular cut tonkatsu would be different (fattiness? tenderness? thickness? hello?) but as far as we could tell, they were quite identical except for price. The cutlets were not greasy but the meat lacked juiciness. It screamed for some Bulldog sauce!! In place of this typical condiment, Cafesta offered a DIY sauce in the form of some toasted sesame seeds, a gingery sauce, and a mini mortar & pestle. It was a cute concept but it did not taste very distinguished unfortunately. The curry sauce that came with my curry tonkatsu reminded me of out-of-the-box S&B instant curry roux. It's not bad at all but I was hoping for more than just instant curry. Perhaps it is an unfair comparison to a typical Japanese curry fastfood restaurant but where's the selection of pickles? Bro found the ramen to be overcooked and the gyozas were more deep-fried than pan-fried. I guess we would not be going back anytime soon even when our cravings for yoshoku hits. Oh well. It's been a rough week. Work was stressful but I've learned to manage that quite well in the last few years. Unfortunately, the extra stress added to my personal life result in a few familiar and hard to ignore patterns. I feel like a very unenlightened person groping around in the darkness for a way out. I know what the exit should look like and I know the relief I will feel when I set foot at that door but I can't seem to believe that this exit indeed exists. I have established a few weeks ago that I cannot see myself being with him long term. This clarity hasn't left me so that's definitely a step in the right direction. I've also come to see that it was not a very good relationship anyway. I swallowed too much tears and put on a brave face more often than I care to count because I really wanted things to go well. Being dumped by him in such careless manner showed me that I just wasn't that important to him. This realization hurts so much because I really did put my heart into building a relationship with him. I thought I found a person who wants to build a relationship with me too but I was wrong. So yes, I know that being free from that relationship is for the better. However, there's a part of me that wish this is nothing more than a nightmare. I would wake up and everything is alright once again. I am well aware that thing changed and people changed since he broke up with me five months ago so this is only wishful thinking. In fact, I have done everything possible to prevent even a friendship. I do not want to be friends with a person who causes me so much pain. It pains me that I am foolish enough to even wish to be with him again. I hate myself for being so unenlighten. I know that my sadness is disproportionate but I do not understand why. I know that I should move on already but I do not know why I am still crying. I really don't know what to do.